What have Microsoft announced yesterday (October 6th 2015)? Microsoft HoloLens: It’s a way to immerse yourself into virtual/real world through holograms instead of interacting with a screen as we all have been doing till now. It’s a real amazing product with a lot of potential once developers start creating content and uses for it. Microsoft presented it with a live demo of mixed reality gaming which left everybody in the public and online with their mouths wide open. Developers will be able to purchase the dev kit for USD 3000 on the beginning of 2016. With this, Microsoft shows what is capable of in terms of R&D of new technologies. You can watch the cool demo here. Microsoft Band (2): It’s a really nice looking new model of the wearable launched last year, with a lot of sensors, including heart rate, calories consumption and barometer among others. It look way better than last years edition, and it’s protected by Gorilla Glass to avoid scratches. Unfortunately they didn’t say anything about battery life and swimming with it, something that would make it the ultimate wearable, lets see if we see anything about this on future reviews. It will cost just USD 249 so it has a competitive price, and will be available on October 3oth 2015. You can watch the Microsoft Band presentation here. Microsoft Lumia 950 and Lumia 950XL mobile phones: While you thought the Microsoft mobile line up was dead, they proved wrong by showing two powerful flagship units that can be plugged to an additional USB-C hub where you can also plug a screen, keyboard and mouse and transition from using your phone screen to using your phone as a light PC, they call it “The Phone that works like your PC”. All your Apps will adapt to your screen and you will almost feel like in a classic PC Windows session. They will be shipping in November, the Lumia 950 for USD 549 and the Lumia 950XL for USD 649. They also announced a more entry phone the Lumia 550 at a very attractive price, just USD 139 which will be available in December, right for the holidays. You can see the live event demo and specs on this video. Microsoft Surface Pro 4: The long awaited new edition of the very successful Surface Pro 3, “The tablet that can replace your laptop”, now comes better than ever, with the new Skylake Intel processor line which is 30% faster and runs cooler than its predecessor. It offers the same great flexibility of being used as a tablet or a laptop whenever you need either of them. Its an hybrid product line which other companies seem to start trying to catch up with, for example Apple with the iPad Pro, Dell is rumored to release a product in this same line among others, but Microsoft was able to keep up the leadership with the Surface line. The new Surface Pro 4 is 8,4 mm thick which makes it thinner and lighter than the Pro 3, the screen is a little bit larger 12,3 inches and with improved quality without making the device physically bigger so that Surface Pro 3 accessories are still compatible. The screen also comes with Gorilla Glass 4 for added protection, something really appreciated. Microsoft has a lot of experience with keyboards, and they really improved it on the Pro 4, also adding fingerprint reader and a bigger glass touchpad. It comes up to with 16GB of RAM and 1 TB of storage, 8 Megapixel camera and front facing speakers. Of course it comes with the Microsoft Pen which can now be attached magnetically to the side of the device (50% of the people using a Surface Pro 3 use the Pen). In terms of overall power, Microsoft says it can run 50% faster than a MacBook Air so it makes it a great product. This device, represents one of the best options for advanced users to use it as a unique device offering the best of two worlds, running Windows 10 with all the applications you are used to work and without having to “purchase”additional versions for your tablet or your PC because it’s the same operating system (a problem I currently have with the iPad and MacBook Pro at home). It starts at USD 899 with a basic model up to USD 2699 the most powerful one (i7, 16 GB and 1 TB). Also, a new Microsoft Surface Dock with a reduced footprint than its predecessor has been also announced at USD 199. 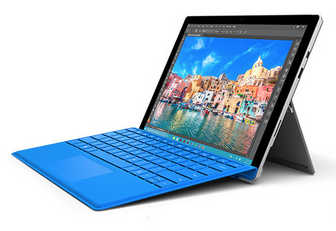 You can see the complete Surface Pro 4 presentation on this link. Microsoft Surface Book: When you think things cannot get better than the Surface Pro 4, they have proved us wrong, by announcing this device which is basically Microsoft’s first laptop, and it’s very powerful. Microsoft has so much confidence on it, that they said it’s the most powerful 13″ laptop on earth. It wouldn’t be called Surface if it didn’t offer at least the same functionalities as the Pro 4, so yes, you can also detach the screen from the keyboard to also use it as a tablet. It comes with a 13.5″ inches high resolution screen, an amazing keyboard which Microsoft described as offering a “perfect experience”, glass made trackpad with 5 points of touch, Nvidia GeForce GPU and 12 hour battery life. They made a very strong statement, they say you can get double performance of the equivalent Apple MacBook Pro. The system Microsoft has invented to separate the screen from the keyboard and GPU base, it’s fantastic and very straightforward to use. It will start at USD 1499 available for pre-order now (The 1 TB version of this babies sold out immediately after the event), and available on October 26th. 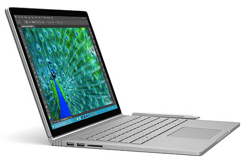 You can see the Microsoft Surface Book presentation here. If you want to see the full almost 2 hours live event, Microsoft made it available on demand on this link. Microsoft is listening to their customers, (not every company does that), they learnt it the hard way, and makes sense, as they are the ones purchasing their products. By improving simple and complex things on their products they are able to deliver great and better products. They are showing they are capable of innovating together with the end users and not trying to push their own way of thinking like other companies do, I think for this we have to thank Satya Nadella (who by the way did the closing of the event) and Panos Panay (I felt as pumped as him when he was telling us about the products, it seems I share the same technology passion as him). From my point of view the two most important and attractive announcements where the two new Surface Pro 4 and Surface Book, they are both really great for their segment. It wasn’t a coincidence that the audience of the event gave Panos Panay a standing ovation when he finished explaining the capabilities of the Surface Book. They were witnessing that this, is the next chapter in PC mobile computing, and its leaded by Microsoft. At the office, I will also promote the idea of Microsoft Surface Pro 4 and Surface Book and will try to get one for internal testing. I seriously believe this is the future, the device that will give you all experiences without having to pay twice the money for it. Having power, mobility and touch all in one device is something multiple companies have been trying to do for a while, but Microsoft #NailedIT.